April 18th – 24th: Singer-Songwritin’ | TOMMY LINK INC.
Over the past year, Songwriter nights have been my favorite up and coming trend in the Erie area. 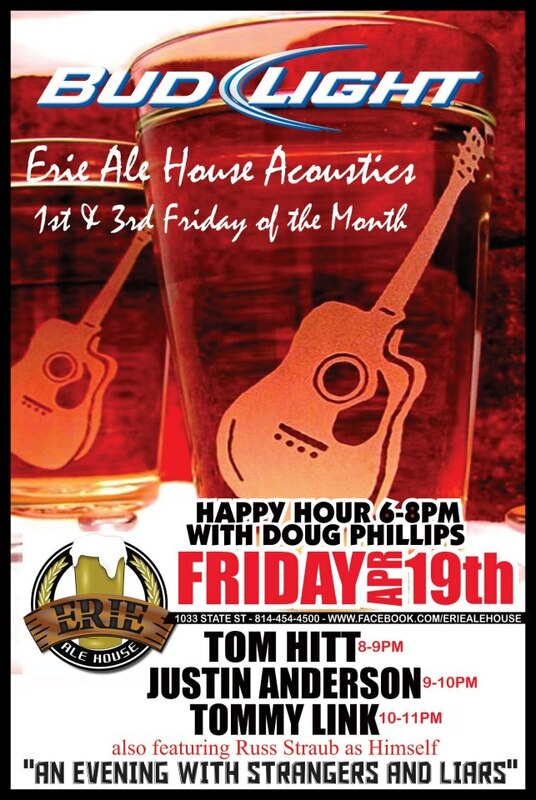 Down at the Erie Ale House, Doug Phillips runs an acoustics show on Friday night, playing music during happy hour and having three songwriters down to play afterwards. Not only am I in attendance to play this week, I happen to be in a band with three singer-songwriters. Since we’re all in the same place, why not? Myself, Justin Anderson (guitarist of Strangers and Liars) and Tom Hitt (drummer of Strangers and Liars), will be performing both as singer songwriters playing as singer songwriters as well as the three of us performing as a band with the help of our intrepid bassist Russ Straub. It will an acoustic performance for the band as well, as we performed for the Arts n’ Drafts Fest this past March. The band also intends to spend some time in studio seeing if we can’t get one of our newer tunes down on paper (figuratively speaking). We hope to have something for you folks to hear soon.